Living seriously offgrid as we do has many advantages and low-cost pleasures but one of the challenges we haven’t enjoyed so much is not being able to vacuum our floors as often as we would like. We have a regular house size upright vacuum cleaner which is very nice but we have just never had enough offgrid power to run it! We were considering buying one of those ‘rechargeable’ vacuums — something we could plug into our existing 300 watt pure sine wave inverter. Then with Christmas upon us and our anniversary only two months away, we thought, “Why not do a joint Christmas/Anniversary gift to each other and take our solar system to the next level?” So that’s exactly what we did. Because we have had such great luck with our Go Power! brand 300 watt inverter we ordered the biggest inverter that company makes = 3,000 watts (ten times the AC potential of our little inverter). 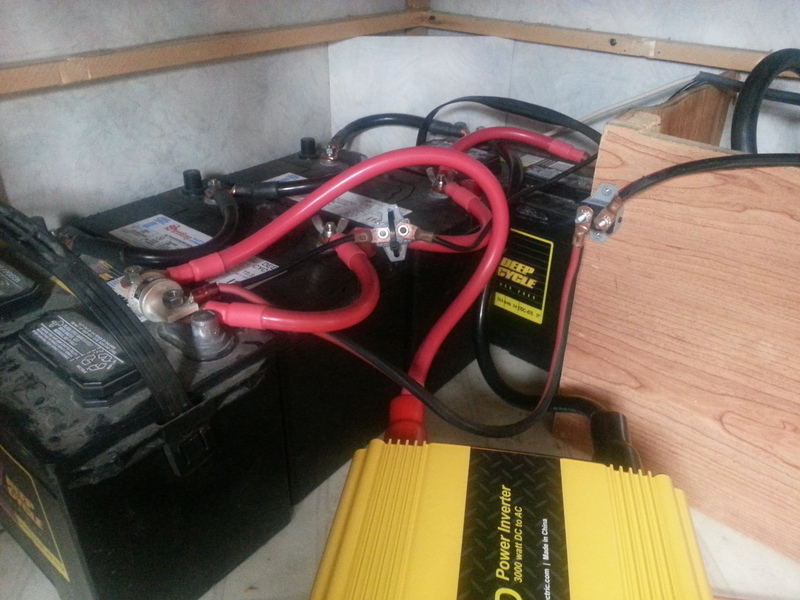 Not to get too technical, but inverters ‘waste’ a bit of power inverting 12 volt DC to 120 volt AC. With lesser loads, it’s more efficient but at full load, our new inverter is only about 82% efficient which means it must draw 18% more power than it delivers. 3,000 watts divided by 12 volt is 250 amps so we fused and sized our cabling for 300 amps to compensate for the extra draw from the batteries. We ordered pre-made cables in the 2/0 size but were still surprised when we got them how big and heavy duty these cables are. To fully appreciate how much bigger these cables are, here is one of the new cables alongside one of the 6 gauge cables we used before. The 6 gauge cables are good for 55 amps but we knew (with our small 300 watt inverter) that we’d never pull more than 30 amps so they were plenty big enough for the small inverter. Removing the skinny “old” cables and installing the new pre-made cables (from custombatterycables.com) wasn’t too tough but I ordered all the cables with 5/16″ terminals on both ends and learned during the install that two of our four batteries have 3/8″ threaded studs on the positive side. Fortunately the terminal ends are copper so it was easy enough to drill out the four terminals I needed to the larger 3/8″ hole. I also am no longer fond of the stock wing nuts and went with regular nuts I could easily tighten with a wrench instead. I also added lock washers when there was enough room for them. I couldn’t bolt the fuse direct to the threaded stud on the battery without putting washers under the fuse terminal. Then I remembered that *all* fuses are resisters and they cause measureable voltage drop. So I put the terminals for the cables from the charge controller *and* the 12 volt power going back out to the fuse box *under* the fuse terminal on one end and bolted it up tight. 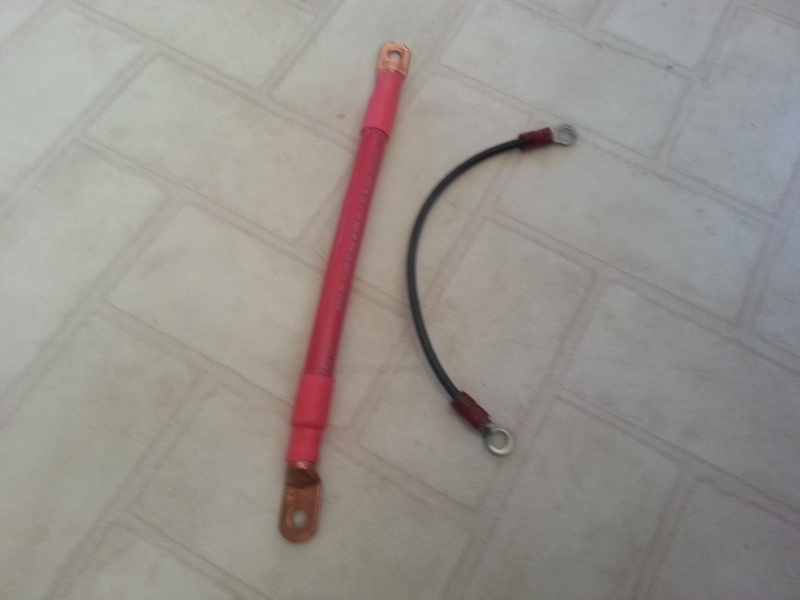 Then I rerouted the large positive cable a bit and bolted it to the terminal at the other end of the fuse. In this fashion, the feed cable is protected *but* the charging power to the batteries *and* the power going back out to the 12 volt fuse panel do NOT go through the large fuse. I should note here that pulling power from a bank of batteries diagonally (as opposed to having both primary cables at the same end of a bank) pulls power quite equally from ALL the batteries in a bank. (There are actually two other cabling scenarios which pull power even *more* equally but it’s tough to justify the cabling complexity for such a minor improvement.] One should also pull power from *and* charge any bank of batteries at the *SAME* two terminals. No exceptions. If you look again at the image above (just above the one of the fuse), you can kinda’ see how the red primary feed to the inverter comes from the near left positive terminal and the black primary feed comes from the far right negative terminal back in the corner. 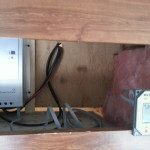 In this image, you can see that the ‘hard wires’ from the inverter were *barely* long enough to run them direct to the new RV-style 30 amp outlet which I installed. One advantage of setting up our added outlet in this way is that no wires or connections are added. 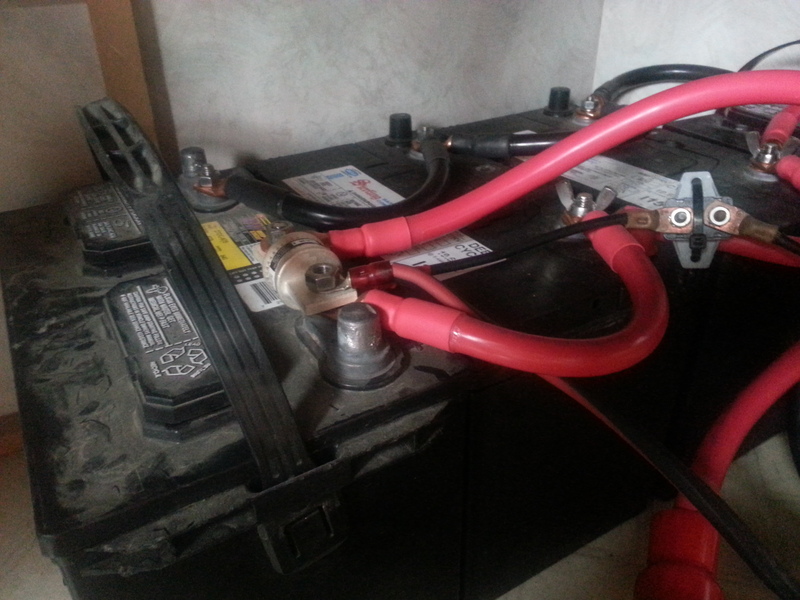 The smaller AC wires (10 gauge ‘hot’ wires and even smaller ground wire) from the inverter go direct to the outlet. This keeps things simpler *and* no chance for added wire nuts to loosen up over time due to vibration and seriously lumpy California roads! Another advantage of adding this outlet is we can plug in our regular 25′ power cord — just like we would if we were staying in an RV park — so doing it this way preserves that option and keeps things *stock* as much as possible. A 3rd advantage is this saves the four AC outlets on the front of the inverter itself for other uses while also powering up every AC outlet or appliance in the house. (1) With a conventional RV setup, there is an unfortunate issue with the converter. For a “whole house” system like ours, the converter pulls power from the 120 volt AC inverter, then converts it to 12 volt DC, then feeds that power to the batteries which feed the inverter and round and round we go with efficiency losses every step of the way until the batteries are dead (or dying) and all we’ve accomplished is giving off a bunch of HEAT (which may or may not be considered a “good” thing). Some folks resolve this problem by flipping the circuit breaker to their converter OFF and leaving it OFF whenever the inverter is ON. There are also magical automatic switches (and magical prices to go with them *and* their installation!) to protect against this conflict. In our case, we are almost never plugged in anyway. At some point, our converter developed a minor issue with a sticking solenoid switch (likely due to lack of use as much as anything) so I just removed the pot licker and stashed it in our storage shed back ‘home’ — end of problem! Besides *most* converters are lame battery chargers in any event — most often just a two or three amp unregulated feed which only works when you’re plugged into grid power (which, again, we almost never are). (2) We also leave the circuit breaker for our rooftop AC turned OFF to guard against any accidental attempts to run the rooftop AC from our battery bank. It’s just not practical to ever consider running rooftop AC with solar power. This also applies to furnace blowers (we no longer use our OEM furnace either), electric heaters and all the other energy PIGS — some appliances are just NOT a good match for solar and IMHO never will be. If we have a chance to plug our main power cord into what we call “shore power” (a boating term but it just means plugging into the grid) and we want to run the rooftop AC, it’s a simple matter of turning the circuit breaker back ON and letting the cool breeze blow. We do plan on using our microwave now and it’s certainly an energy PIG but it pulls power for such a short amount of time that we find it doable. Keep in mind that microwaves pull 40 to 100% of their rated power. So a 1,000 watt microwave can pull up to 2,000 watts. (5) The debate over how much discharge your batteries will tolerate without “damage” rages on and I don’t want to get too deep into it here. But all the major battery manufacturers now agree that regularly discharging a battery 80% (leaving only a 20% SOC = State Of Charge) does absolutely NO damage to the battery itself. It IS true — like anything else — if you work your batteries twice as hard, they’ll only last half as long but there is absolutely ZERO economic advantage to only discharging your batteries to 50%. Please do your part to help dispel this urban myth! Allowing your batteries to discharge down to 11.8 volts permits them to do 60% more work(!) *plus* this is the energy most easily replaced when the sun comes up the next morning. Charging batteries is like airing up a tire = easy at first and then progressively harder (requires more energy) as the tire nears maximum PSI. This is why smart chargers (and the better charge controllers) do a bulk charge first and then once the batteries are recharged, ours does a two-hour “boost” at higher voltage and lower amperage. Then the 3rd phase is a “float” — which just keeps the batteries topped off until sundown. (6) MSW inverters work plenty well enough to power up most things. The reality is that for any given size, MSW inverters are 1/3 to 1/4 the cost of PSW (Pure Sine Wave) inverters and that’s why they are popular for larger loads. Two things which do NOT play well at all with MSW inverters are chargers for cordless tools *and* compressors for regular residential-type AC refrigerators. MSW inverters are also *NOT* recommended for sensitive electronics = computers of any kind, TVs, DVD players, cell phones, etc. The MSW inverter will power up any of these appliances/devices but you can expect less than optimal performance *and* a much shorter service life. This is why we have a smaller (300 watt) pure sine wave inverter for all our more delicate devices. 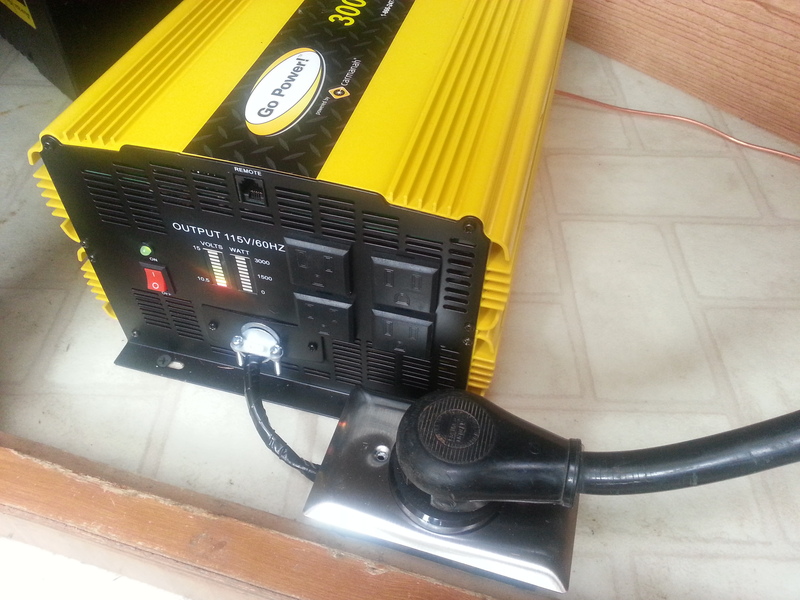 My cordless drill battery charger pulls 240 watts but our PSW inverter runs it just fine. In fact, the cooling fan for that smaller inverter has only come on 2 or 3 times in 14+ months. If you discover any other appliances/devices which don’t play well with MSW inverters, please make a comment below and I’ll include them in this note. (7) My cautions against “bonding” between neutral and ground *only* apply if you’re using a MSW inverter to power up the AC power supply panel for your whole RV (by plugging your main power cord into an added 30 amp RV-style outlet). 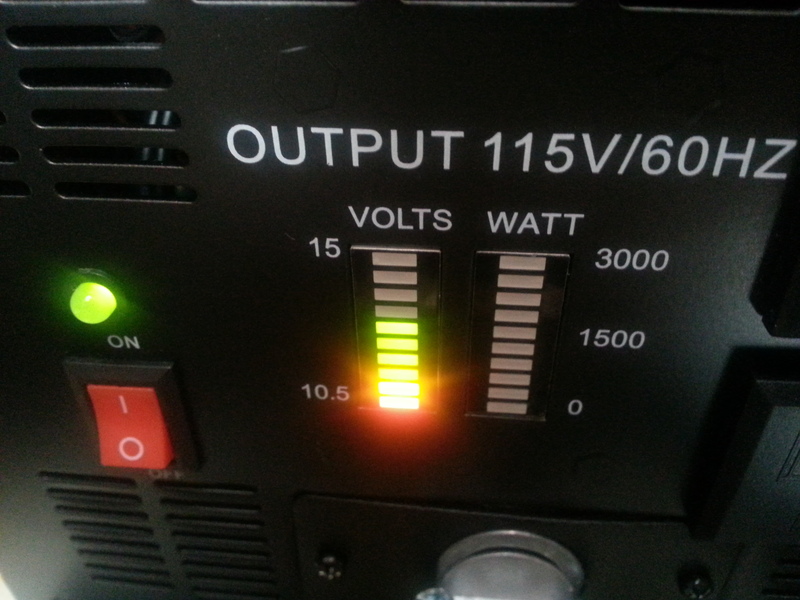 For example, our 3,000 watt inverter has four regular outlets on the front of it. We can plug whatever into any of those four outlets and NONE of this “bonding” stuff is an issue because you’re not feeding power to your AC power supply panel if you’re just plugging a device or appliance directly into the inverter itself. But if you ADD an outlet to plug in your main power supply — what I call a whole house” system — then ALL of the cautions about “bonding” DO apply. If there is a way to make this any clearer, I’ll appreciate all the help I can get. 🙂 I do NOT want anyone hooking their stuff up wrong and then faulting me for a poor outcome. Ultimately, YOU are responsible for your *own* actions and any bad consequences, injuries, bloody noses or hurt feelings are yours and yours alone to suffer through. Working with electricity can be extremely dangerous — possibly even fatal. So do *NOT* venture outside of your comfort zone. Ask someone more knowledgeable to help you. Hire a pro if you must. But don’t blame ME for trying to help for FREE . . . are we clear on this? 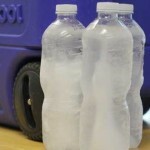 Frozen Water — Not Ice? 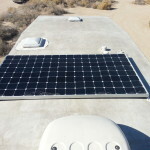 Solar Success — Another Notch in our Freedom Grip! Thank you Jim. As always, you are doing the work for the people for free. Thats the hallmark of a truly giving person, thank you for sharing, and thank you for all you do for so many. Thank you Dr. K for always being so positive, encouraging and uplifting! We are still hunkered down here at The Slabs — building a 18′ x 16′ barn which is 12′ tall. In years to come, I hope to use it as a shop — maybe build a shed or two each winter and make an extra buck or two. I’ll do a blog post about it when it’s further along. 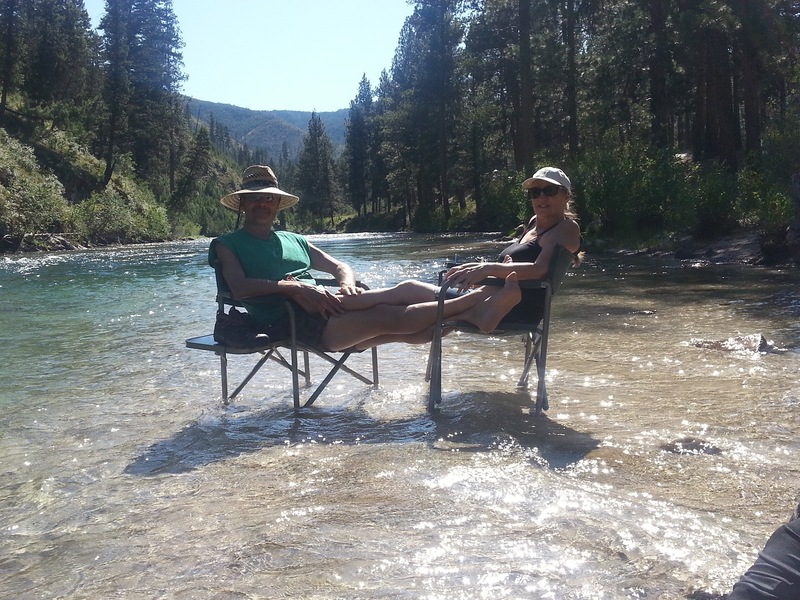 We’ll be back in the Boise area towards the end of May this year — looking forward to one of our lunches! Do you have enough battery to go to a regular 120v compressor fridge? When I had the class A we spent most of our time plugged in and the real fridge was a lot nicer than the RV 3 way was. so the battery manufactures did away with the cycle life vs how deep the discharge? (X number of lifetime cycles at 20% draw down vs Y number of lifetime cycles at 50% vs Z number of of lifetime cycles at 20%). The last time I looked (I think it was at the Trojan site) they had a chart for figuring the life of the battery where the more work you took out of the battery the less cycles it had in it. Drawing it deeper didn’t hurt the battery it just used it up faster… the “tanstaafl” factor. it’s good that you have enough of the right kind of juice to do what you want to do! I’d look into the real fridge, that made life a lot better when I did that. I did have to take the door off the new fridge to get in in the front door of the class A…. Thanks for your comment and thanks for following our blog! 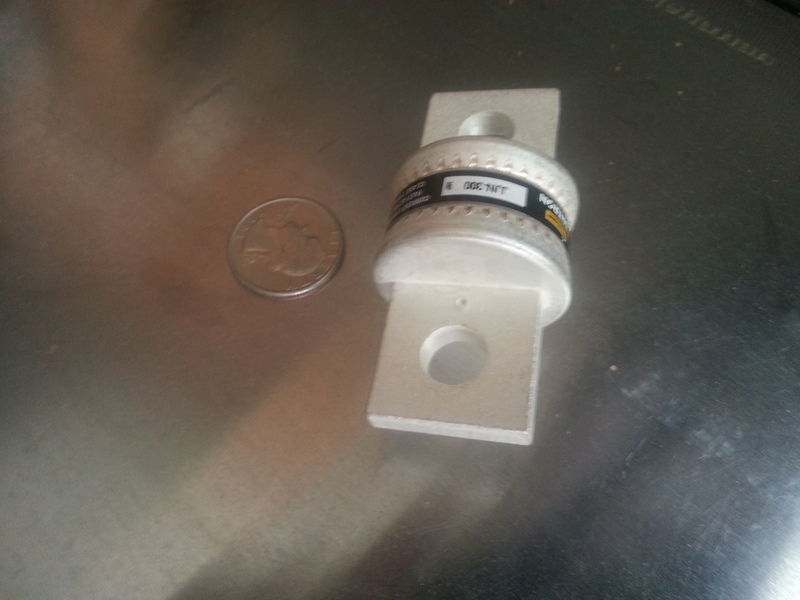 Second, I’ve searched by can’t seem to discover what kind of ‘bolt on’ fuse you show in the photo. Not sure what to search for. 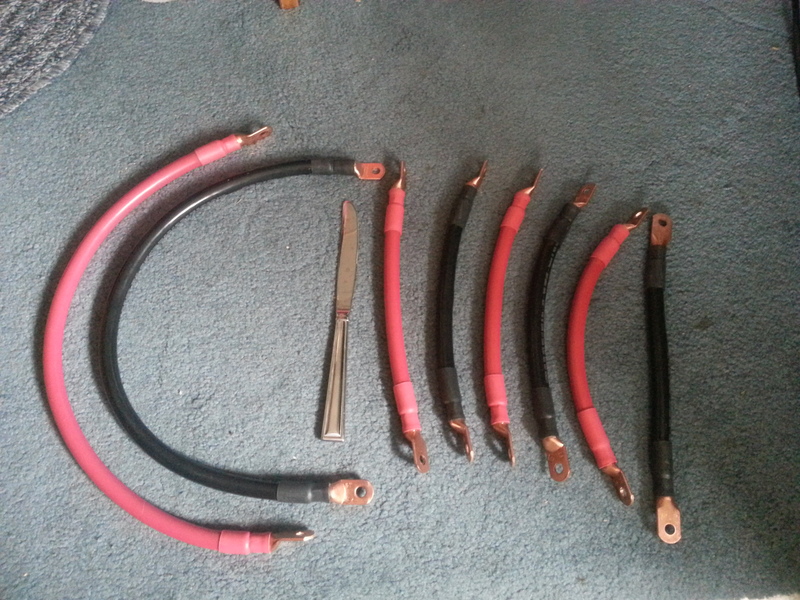 Thanks for the link but we need to make sure these are DC *and* for his size inverter he’ll need a 300 amp or 400 amp bolt up fuse (or comparable circuit breaker with manual reset). As we ordered our 2/0 cables premade from custombatterycables.com it was easier to use the bolt up fuse *and* bolt it up in such a way that the smaller charging/discharging cables (*not* the ones going to the inverter) didn’t have to run their power through the resistance (inefficiency given off as heat) of the fuse. It was just a starting place to look. You can search for larger ones at Amazon *or* size your cables and fuses *down* according to what you think your actual loads will be. All the fuse does is protect the cables, so always make sure your cables are rated for more amps than the fuse they are on. And there are circuit breakers which might work better and it looks like they’re cheaper too. Hope this helps and feel free to ask as many questions as you want. I’ll do my best to help. What’s up,I check your blogs named “Adding Our 3,000 Watt Go Power! Inverter | Sailing On Dry Land” like every week.Your writing style is witty, keep it up! And you can look our website about powerful love spells.